Designed by Guy Hollaway Interiors, the Workshop is a new serviced office, housed in an impressive 5 storey building on the Kent coast. Providing flexible workspace and a range of different working environments The Workshop is described as "A hive of activity and creativity with a community of like-minded individuals dedicated to growth - The Workshop really has only just begun. It offers the latest in office design and technology whilst providing flexible work space and meeting rooms in an area surrounded by art galleries, restaurants, theatres, and of course, the beach." 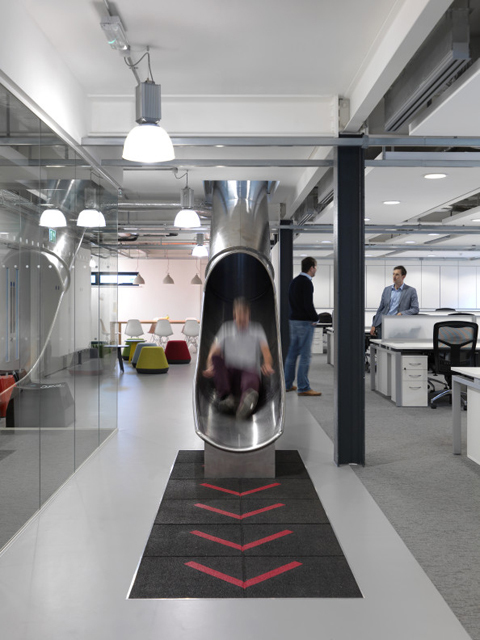 The 6 metre long stainless steel tube slide was installed between the upper floors to create a sense of fun for the staff and allow them to whizz between floors in 3 seconds! We're delighted to see that our Hyde Stools and Burgess Compact Tables also add their own unique sense of playfulness to the space and with it a splash of colour to the industrial interior. We're pleased to announce that Ralph Buschow of Studio Buschow recently approached us to use the AR001 & AR002 arm chairs and sofas for the new work space at the London creative communications company CHI & Partners. We're glad to see they've bedded in well. Thought we'd share a couple of pictures of the AR002 sofas in their new home at Cafe Lusso in Seoul Korea... Designed By Sherlock Studio Lusso is a premium coffee brand in Korea with a 360° approach to growing, sourcing, transporting, roasting, grinding and serving the very best coffee from around the world. Lusso approached Sherlock to help them develop a unique environment that delivered a bespoke coffee experience to the city of Seoul - rather than the larger, global coffee chains. The eclectic approach to styling and sourcing has resulted in an environment that is truly eyecatching. The education bar, the 'floating' coffee unit & furniture bring theatre to the customer and has created a unique place to hang out in the city. On a recent trip round our neighbourhood (south east London) we took the opportunity to visit the innovative Deptford Project for a cup of coffee and a good dollop of urban inspiration! Cleverly converted into a cafe by Studio Myerscough this 1960's train carriage is a colourful addition to Deptford High Street. Friend and fellow designer, Jason Milne is currenty writing an online degree course for the Interactive Design Institute. According to the IDI's website this will be "a degree programme from the University of Hertfordshire which is designed to prepare students for a range of careers in the fields of Interior and Spatial Design. The programme focuses on contemporary and future practices in interior and spatial design, including the use of new technologies, business skills and recognition of new corporate environments. The degree incorporates design for commercial and domestic interiors, exhibition, retail interior, event venue, and corporate interior design." Jason approached us to ask if we could contribute some examples of concept sketches and organisational diagrams to the course. We were only too happy to help. Grand Design Live 2009 featured a full size mock up of the brilliantly designed ECO modular house from the Cornish company Cloud Nine. Stunning design, low carbon living and with a reasonable price tag; could this be the future of modern house building? Wishful thinking... but we do hope so. Apparently they take four months to fabricate in the factory and ten days to assemble on site. Does this actually mean it's possible to build stylish contemporary housing quickly and on budget. Things are looking up!